The most famous light tank of World War II, with a total of 13,859 vehicles manufactured from 1941 through September 1943. 1,576 tanks (mostly of the M3A1 version) were supplied to the U.S.S.R. under Lend-Lease, and many more to the British. This tank was given to players on wargaming's 15th anniversary, and world of tanks blitz's first birthday. It is quite poorly armed, but is fast. 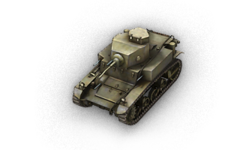 The M3 Stuart is better than it in every way except credit coefficient as this tank has the turret of the tier II light. It is a very effective flanker, with a good rate of fire, but poor penetration, so hitting weakspots or sides is a must. The front is immune to autocannons, so keep this in mind. It also has an ability to be one Tier 3 tank that the T82 has a hard time one-shoting with its "derp" howitzer. To the annoyance of T82 drivers, the front armor cannot be penetrated by regular HE, and the sides are remarkably strong. Coupled with the tank's agility, this makes it a good tank to take on these destroyers. This page was last modified on 4 January 2017, at 15:18.